CLICK ON THE PICTURE TO ORDER!! 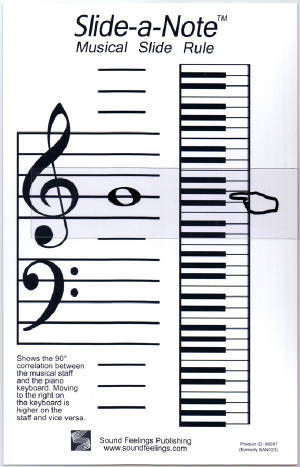 One of the main obstacles to learn to read musically..(believe it or not) is the size of the notes on the page. When they are that small, it is hard to see where they are on the staff. This is really confusing for kids. They are 20+ inches away from the page and then we ask them to count lines and spaces. Even if they CAN do this, it is INVALUABLE to have the SLIDE-A-NOTE NOTEFINDER around to pick up, match the note, and count the LARGE lines and spaces. When you have those large lines and spaces to count, children will succeed at identifying anchor notes (Middle C, D E A and B), then the surrounding notes. Reviewing notes with the SLIDE-A-NOTE one minute a day is all your going to need. HINT: When you review your notes with the NOTEFINDER, Say the note 1st, then play it. (SAY-PLAY). If you do these things, your children will read notes. PLEASE SEND ME YOUR QUESTIONS ---this is important! CLICK THE PICTURE and order the SLIDE-A-NOTE NOTEFINDER!